The hits and the misses at the Golden Globes! Here we are at the start of the awards season in the US for 2015 and as usual the kick off event that gets global recognition is the Golden Globes. Straight away the first thing to notice is the direction that the fashion is taking for the year with those who are there and also to note that of course whilst the glamour abounds there is also a bit more of a casual approach to dressing, unlike the Oscars that see all the high end fashion hit the red carpet. This year saw some real old style Hollywood glamour return to the red carpet and there were some real stand outs in terms of what the stars wore…there were also some real misses that just did not work. Sometimes when watching on TV or looking at the final prints of the red carpet shots you really do not get a true representation of the colours but you can tell when an outfit fits perfectly, if the tailoring works well and if the accessories all work with each look. As most of the stars these days have stylists who work closely with them, when they do get it wrong it is hard to blame the star, although if someone put me in an outfit I was not happy in I would let them know! The stars this year for the most part got it right and of course there were the real stand outs and some real mistakes as well. Frances Oconner looked stunning in this gown from Leanne Marshall and let the dress do all the talking. The lace bustier was detailed enough to stand out and with her hair up and little jewellery this was a simply stunning look from the Perth raised actor. I have always been a fan of Kelly Osbourne and love her on Fashion Police and she did not disappoint in a stunning blue gown from Edition from Georges Chakra, with an embellished collar finishing the look she was stunning. 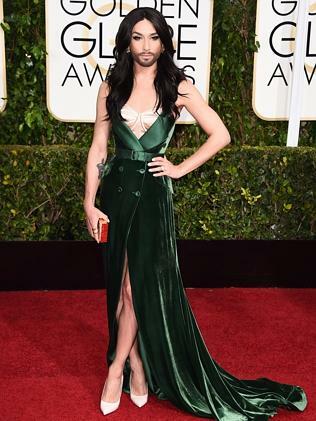 Conchita Wurst came into our minds when she went on to win the Eurovision song contest last year and stunned the red carpet with this stunning green velvet gown and salmon bustier. She certainly turned heads with it! Amy Adams always seems to go for these sort of grey/blue tonings and in this Versace dress you can see why. The dress was perfectly tailored to her body and with the addition of the simply drop earings and swept to one side hair made for the perfect picture of a Hollywood A lister. Emma Stone went against the trend of the night, but was a real star in her black tailored pants with a stunning silver bodice and long black sash. She has once again show her distinct style and how to really work a red carpet with style and panache. Kate Hudson was one of the real stars of the red carpet in this stunning white cute out design from Versace that showed just how stunning this mother of 2 is! She showed just what a star she is and worked that red carpet like she owned it and she did! Heidi Klum has had a couple of disasters in the past couple of years on the red carpet but this time she got it so right! She was simply irresistible in her gorgeous red Atelier Versace gown! Then there was plenty who went for the metallic look and one who did a great job with it was Dakota Johnson in a shimmering Chanel gown with a split right up the front. The Fifty Shades Of Grey star was channelling Hollywood star all the way! Jennifer Lopez in her Zuhair Murad dress was another stand out who posed, preened, pouted and delivered an impeccable red carpet performance on her way into the Globes. She had everyone talking about how amazing she looked and quite frankly it was a look that might not work on everyone but on Jennifer it was perfection! Julianna Marguiles just looked plain frumpy in her red dress…it sat all wrong and with her hair up it made her look quite matronly…enough said! Ellie Kemper looked happy to be at the Globes but her dress was much too complex and ‘busy’ to really work. It just did nothing for her figure at all! This dress on Amanda Peet with all of its draping just did not work either. It was just too loose and did nothing for her. It did not accentuate her fabulous figure and was a real miss. 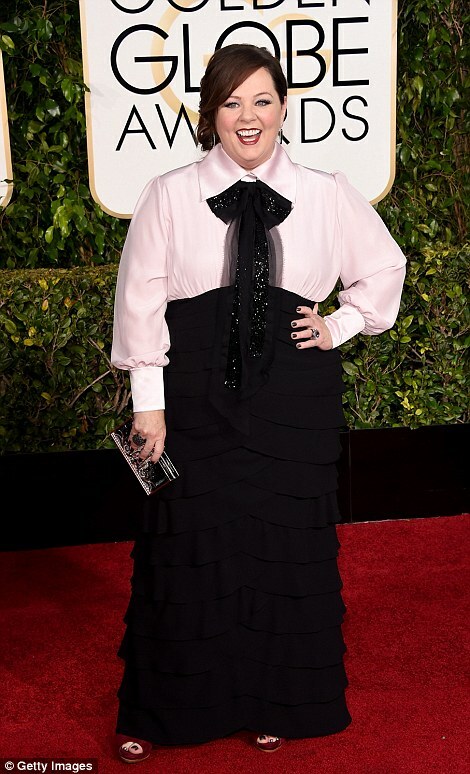 Melissa McCarthy just was all wrong…she reminded me of one of the dollies that my mother used to put over the toilet rolls. This look was all wrong! The top half looked like she could be serving behind a counter in the fragrance section of David Jones and the bottom half is just plain wrong and the red shoes…uh! Tin Fey usually dares to be different but in a good way but got it really wrong this time. This was gorgeous from the bust to waist but once you got to the bottom part of the dress you could be forgiven for thinking she was wearing a parachute…it just was not a good look at all and again did nothing for her fabulous figure. So there are my 10 hits and 5 misses…you might not agree but they are just the musings on a fashion follower all the way in Perth, Western Australia! This year there were not that many misses and on the whole the stars looked great…and now onto the Oscars to see what else is coming up. Back to Blu for a new year dinner with Cristal! When will ENUF be enough?